hands of the Sirba Octet’s classically trained musicians (almost all of whom are members of the Orchestre de Paris), this klezmer and gypsy music flourishes, brightens and sparkles like a freshly cut diamond. accomplished of Sirba Octet’s works. […] A magnificent example of successful musical fusion. The whimsical nature of gypsy music and the precision of classical have never married so well. Surrender to its joyfulness where nostalgia is never far away. Let’s dance to classical world! The sophistication of classical meets the vivacity of world music. Emotionally contrasted, Tantz! is typical of its traditional roots but also perfectly in tune with our modern era. ballads into whirling dances […] Tantz! 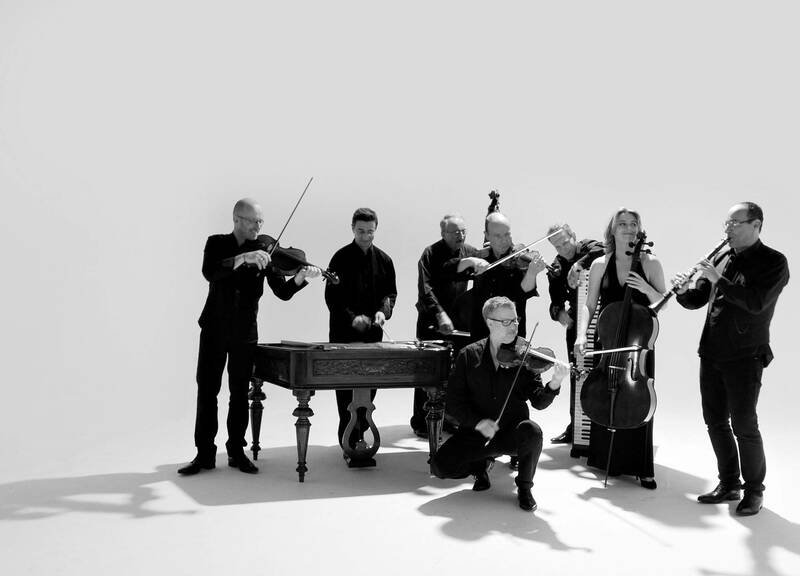 offers its audience a taste of the octet’s repertoire with its classical elegance, boundless energy and consummate lyricism. astonishing talent of every single musician. The volleying cimbalom, the hiccupping klezmer clarinet, the giggling violins and the deep bumblebee drone of the double bass are performed as chamber music. A musical fantasia with an element of chaos that makes it hopelessly nostalgic of Eastern Europe. These pieces of music possess an ephemeral quality – the dreamy weightlessness of the calm before the storm. with astonishing freedom of interpretation. journey guiding us with clever musical tricks. Letting the instruments the lead their renditions are at times nostalgic and touching, at times comical. The audience goes away with an indescribable energy and vitality. musical moods heard throughout the session. really sets the stage alight. Swing numbers and tap dancing are in there as well, whisking the audience off at a frenetic pace. There is more to Yiddish than the language. There is the music. the soul of the people, their culture, their history, their roots, their way of life and their way of singing about life. Amid smiles and tears, it rejoices in love and relishes life… Yiddish Rhapsody is a musical bridge between past and present, what we are and what we dream of becoming, like the family ties that bind us forever. tune blends with Isabelle’s modern vocals and explosive tap dancing. When these musicians from the Orchestre de Paris turn their hand to Yiddish pieces and Broadway numbers, it doesn’t feel like an awkward transposition. They’ve achieved a rare concoction – the precision of the classical musician with the creativity of the amateur. tails with a giant flower in the buttonhole for the dazzling I Got Rhythm). from childhood joys and love of life rubs shoulders with abject suffering. shows at the Alhambra on 12th and 13th April.